Richie’s off our UK screens. The Oval Test is likely to be his last televised broadcast in the UK; he’s been on our screens, amazingly, since 1963 when he started with the BBC. Summer won’t be the same without him. Shane Watson hit an unbeaten double-hundred today, against Warwickshire. He’s a very useful Cricketer, and I’m surprised he hasn’t been called up as cover for any of Australia’s out of form, or out of luck, bowlers. For some time, I’ve watched Zimbabwean cricket teams either become decimated when batting, or demoralised when bowling. Today, it was neither, as they nearly put up a genuine fight against New Zealand – but they ran out of overs, losing by 27 runs. What is to be done about them? It is a complete farce and, in my opinion, is diluting the intensity required and expected at International level. Full report at Cricinfo. I suspect the rivarly between Indian and Pakistani cricket sides is far fiercer than that of English and Australian ones, but that’s not to underestimate the Ashes battle. This series has demonstrated just how much that little urn – it really is tiny – means to Britons and Australians. The Australians have beaten all-comers over a long time, but this time they have been comprehensively outplayed, despite the close finishes, and it’s about time we put aside our penchant for Pommy-bashing and delivered credit where it’s due. As much as it pains me to say it, England is the new Australia. 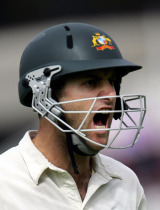 Matthew Hayden is a good example of the out-of-form/outplayed conundrum. To those Australians who question why I’m making such a deal of gaining the respect of Australia as a people, you have to understand what Britons have been through. It isn’t so much the losing that we hated, nor being outplayed. Every. Series. It was the total lack of respect Australia showed us. “England didn’t deserve it!” you cry. Maybe, but lack of respect arguably hurts the most, and it is perhaps this reason alone which makes this summer taste all the sweeter. Glenn McGrath’s comments of a 5-0 whitewash. Hayden’s uber-confidence which, remarkably, has continued unabated even at this late stage of the series. Mark Waugh writing England off (“seen it all before.”). Peter Roebuck saying, well…you can well imagine. As I’ve said all along, whatever the end result may be, let us just earn the respect of Australia. And we’ve done it. That’s what’s made my summer. As an Australian, Indian, Icelander, Englishman, West Indian or any other nationality, what about this series has made it for you? Photo taken by Joris Machielse @ Flickr.com. No it’s not a spelling mistake…I’m trying to be funny. Geddit? No, fair enough. 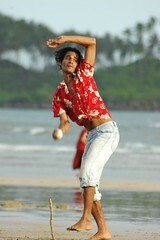 This Indian is having a bowl on a beach, but the photographer says he’s a pitcher, or a “trower,” whatever a trower is. Who wants to tell him [the photographer] the proper terminology, or shall we sit back in smug satisfaction that we know the rules and he doesn’t? The BBC have done an excellent Ashes blog round-up, mentioning most of the motley bunch that write about Cricket and the Ashes. Well done all! Billy Bareham, from Sussex, said: “Katich was being booed and jeered, although I did not hear anyone say anything specific to him. That’s just not cricket (sorry – predictable). Cricket more competitive than Football? And this is an important point. My Editor at Cricinfo interviewed Martin Corry a week ago, England’s Rugby Union Captain, who was coy about the effect winning the Ashes could have on Cricket in this country. Read the interview here. There was a bit of discussion on the Cricket v Football debate here, a week ago, and for more on this see my Football tag.